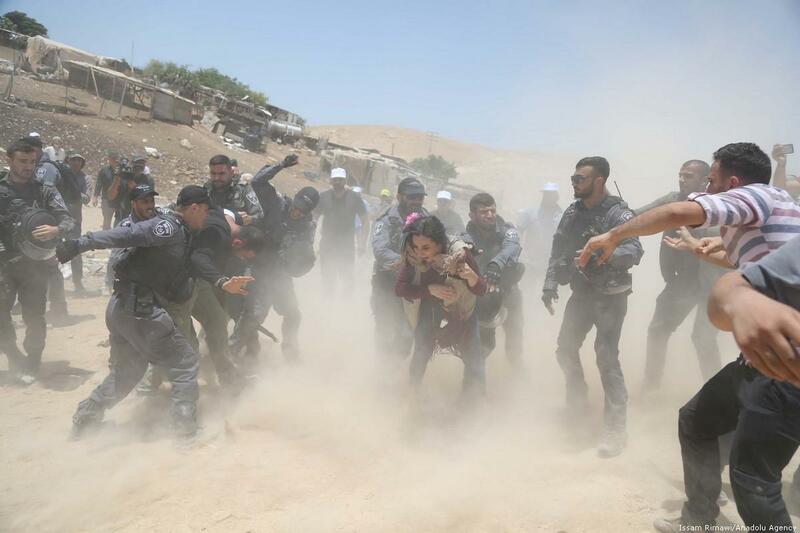 The Israeli occupation's Supreme Court decided to start the demolition and forcible transfer for the Palestinian Bedouin village of Al- Khan Al- Ahmmar, east of occupied Jerusalem, during one week starting from September 5, 2018. We consider this politicized court decision as a prelude to implement a massive forcible transfer for villages and communities in the whole area called (C) and particularly what known as (E1) plan, starting from Al-Khan Al-Ahmmar, and that this court decision is identical to the Israeli occupation government's decisions and policies, without due consideration from the court to the legal supporting documents submitted by the Palestinian lawyers on behalf of citizens on ownership and other entitlements of Palestinian citizens in this plagued village, which evidently proves the fact of private ownership and that this village had been existing tens of years before the occupation and despite the willingness of citizens in this village to organize and regulate their buildings and facilities according to the "applicable laws and regulation". The occupation government senior officials welcomed this court decision that was described "brave" by the Israeli defense minister Avigdor Lieberman, while the Israeli Agriculture minister Uri Ariel said that this unprecedented judicial step should be applied on all villages and communities. This court verdict is contrary not only to the "applicable laws and regulations" but also to all International Laws and Legitimacy that reject the policy of forcible transfer and ethnic cleansing. The Israeli occupation authorities adopt different policies and procedures on the ground to applying stringent corrosive environment on Palestinian citizens in the occupied Palestine and mainly in the so called area) C), to implement their creeping silent transfer of villages and communities to impose geographical and demographical facts on the ground to put and end for any possible future negotiations with Palestinians and eventually put an end to the two-state solution. Shoulder their responsibilities in face of these War Crimes. Practice the maximum pressure on the occupation government including imposing of sanctions and other diplomatic and political measures if the demolition and forcible transfer is implemented, to compel the occupation authorities to adhere to the International Laws and Conventions. We urge EU member states and other states to immediately recognize the Palestinian State on the 4th of June 1967 borders with East Jerusalem a capital. We call upon the third party to shoulder its legal and humanitarian responsibilities towards the on-going grave violations and affected population, according to the signed intentional agreements and conventions. Locally, we call for an open mass set-in to support the plagued village of Al-Khan Al-Ahmmar, and in support of citizens' resilience to protect their presence in this village, houses, properties and school.